What World Are You Investing In? What we invest in today will determine the world we live in tomorrow. Impact investing is unlocking significant sums of private investment capital to complement public resources and philanthropy in addressing pressing global challenges. The GIIN is proud to play a leading role, alongside others committed to growing this marketplace. Join the GIIN and hundreds of impact investors who are engaged in this movement to redefine the role of capital and channel its full power to create a better world. Investors around the world are unleashing the power of capital to have a positive impact on the world. How? Impact investing. What are the returns for impact investing? Who is making impact investments? Already active in Impact Investing? What’s Next for the Future of Financial Markets? Drawing on the GIIN’s Roadmap for the Future of Impact Investing, the GIIN and ImpactAlpha are leading a conversation about the actions needed to build the impact investing movement. The GIIN launched the Core Characteristics of Impact Investing, a set of four tenets that define the growing space and provide financial markets with greater clarity about what constitutes credible impact investing. The Core Characteristics establish baseline expectations for impact investing and serve as a reference point for investors to identify practical actions they can take to scale their practice with integrity. 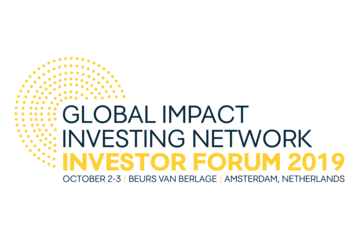 On 30-31 October 2018, more than 1,200 investors from around the globe convened in Paris for the Global Impact Investing Network Investor Forum. The event brought together the worlds leading impact investors, as well as those who were exploring the practice, to learn from each other and explore how impact investing can reshape the future of the financial markets. The 2019 GIIN Investor Forum will take place in Amsterdam on October 2-3. Learn more here. Read our latest opinions on key topics within the impact investing industry, including mainstreaming, impact investing definitions, and the UN Sustainable Development Goals. 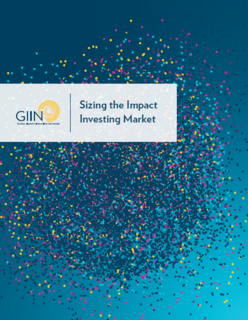 Access the GIIN’s growing repository of resources and tools developed to help investors deepen their practice of impact measurement and management. Learn more about the GIIN’s work to support the meaningful participation of institutional asset owners in the impact investing market. If you are a large-scale investor, join this growing community of practice and access the latest GIIN education resources and performance research. Explore the GIIN’s self-guided course to find out what steps impact fund managers take to effectively raise and deploy capital towards today’s most pressing social and environmental challenges. This resource seeks to answer questions that are core to a fund’s operating and investment strategies, such as: how does an impact investment fund manager identify investors, find investee companies, create a fund management team, and more. Learn about the GIIN's campaign calling for investors to direct more capital to the UN SDGs, and explore the profiles of various investors that have already taken action to address these goals and build a sustainable future.